While we’ve mentioned the Cake Mixes before, we were waiting to tell you more about them until you could actually get them. So what is a Cake Mix? It’s a 10″ x 10″ pad of triangle paper sized for using with Layer Cakes. There are 45 sheets in each pad – one for each piece of fabric in a Layer Cake plus a few extras for “testing”. Recipes? There are four different grids so there are currently four different recipes. Two of the recipes make two different sizes of half-triangle squares from the same paper, and the remaining two recipes make a single size half-triangle square on each sheet. Is that it? Nope. Each recipe pad includes at least four block options for the HTSs made with that recipe grid. There is also information on simple settings and layouts, and how big the quilts would be. Think of the Cake Mix pad as being like a Devil’s Food cake mix from the grocery store. Take one Cake Mix, add 1 or 2 Layer Cakes and you’ve got everything you need to make a quilt. Or a chocolate cake. It’s a great cake too – simple, fast and just a few ingredients. But if you start adding extras – like a can of cherry pie filling – and you can turn that chocolate cake mix into Chocolate Cherry Bars! I saw this quilt on Pinterest and started trying to figure out if I could get the parts I needed from a pre-cut. Two matching charm packs were quickly rejected – the block would be too small and I would be two small HTSs short. Layer Cakes? A few sheets of paper and lots of numbers and squares later… what you’ll find in Recipe 2 was complete. I drew up several grids and the next thing you know… we’re making Cake Mix quilts for Fall Quilt Market. While the Cake Mix pads include everything you need to make most of these quilts, we wanted to write “recipes” for each of the quilts we’d made to let you know what we’d done. And because recipes really should be about cookies, cakes and such, the quilts got names to correspond with an edible recipe. Recipe 2 – 2 1/4″ and 4 1/2″ finished. The number of recipe cards required to make a block varies – it depends on the block and the recipe. I know… it’s confusing but it’s kind of like how many slices of cake you can get from a 9″ square cake. It all depends on how you cut it – squares or rectangles – and how big the pieces are. To put this all in one place – Go to Fun & Free at the top of this page. From there – Cake Mix. 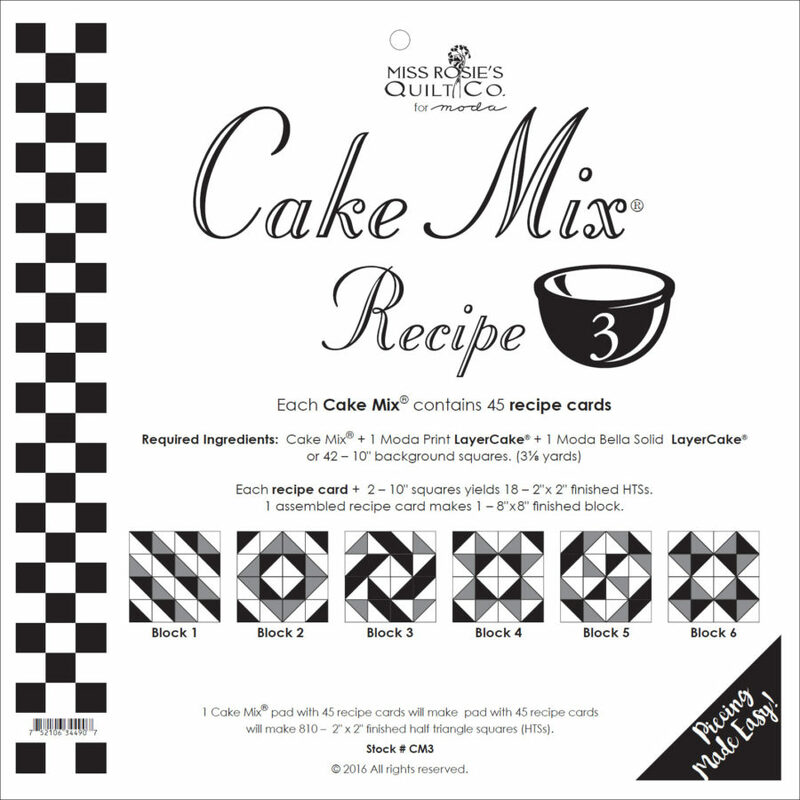 Cake Mix Recipe 2 – the quilt at the end is Lemon Bars – made with Lulu Lane by Corey Yoder. As for the rest of the page – those are the recipes for each of the quilts we’ve made so far. And yes, the edible recipe behind the name of each quilt is included in the PDF. download. Bella Solids and a few extra fabrics. And there’s something about a Sugar Pie coming too. I’m sure I’ve forgotten something… it’s a common occurrence. The Julia in the Twister movie line wasn’t Julia Child but she does tie into this. Like so many others, I loved Julia Child. Smart, funny, independent and her own woman – it stands to reason that she said a lot of smart, funny and very wise things. Each Cake Mix pad includes a quote from Julia Child. My favorite is – A party without cake is just a meeting. Layer Cakes and Cake Mixes. Previous Previous post: Basics. Patchwork. QuiltAlong. I am the pastry chef of the family. This sounds so creatively cute! I do cute. Hi Gabriella! There are more videos coming – from Moda and from others. To answer your questions – yes, one pad will make enough pieces and blocks to make one quilt. Though the two Shortbread quilts were made using a single Cake Mix pad, one print Layer Cake and one Bella Solid Layer Cake. A little bit of yardage for sashings and borders and we had two terrific throw-sized quilts that would be great for kids. These are awesome and appeal to me in so many ways! Just brilliant! Well, the good thing about these cakes is that they are all sugar free, right? Your link needs a “/” at the end to work. Also, I can attest to the GREAT carrot cake, mandarin orange cake, and lemon bars… the food recipes, not the quilts! I agree with David…brilliant! 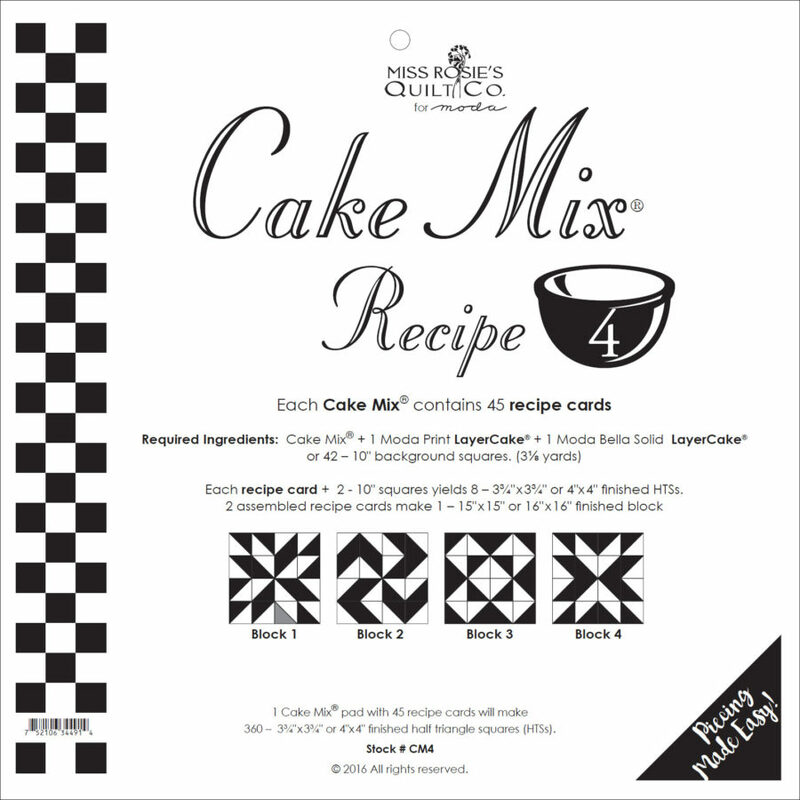 The cake mixes look as though they would be great for beginner quilters as well as advanced with so many block options. Can’t wait to see them on the shelf of our local quilt shops. I can’t wait to try these. What a great idea. How cool is that? What a great idea and you must be a genius! Looking forward to these cake mix papers and quilts. These sound so yummy. Can’t wait to see them! I want to try All Bark. Love Basic Grey. Sooooo where can I buy these yummy desserts? You knocked it out of the park, again!!! I am agreeing with David, this idea is brilliant and I can’t wait to get my hands on one and play! I also love Julia Child and her wit and wisdom, not to mention her energy. This is going to be great fun for me! I love this! The video was very clever. Cannot wait to try these cake mixes out. Thank you Moda. We all know that Moda + Carrie = something great!!! Fantastic! So fun!!!! Looking forward to trying these out. What a fun idea! Can’t wait to be able to buy one!
! Where and when will this be available? 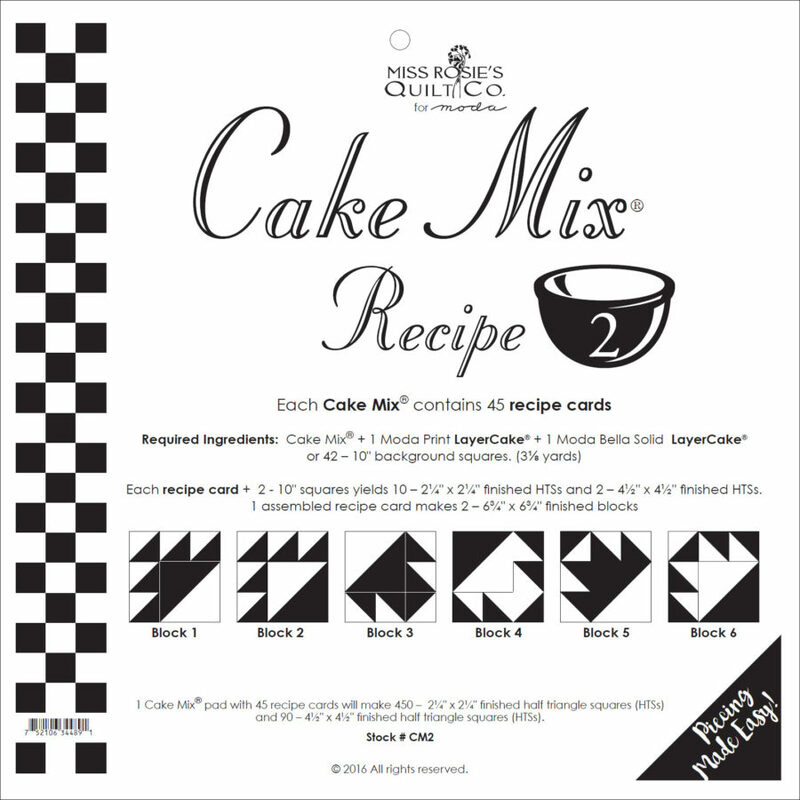 Hi Ruth – the Cake Mixes started shipping to quilt shops on Monday so they should be arriving any day now. Hopefully, your favorite quilt shop ordered a few. JuI st when I think I’m in a disciplined and orderly march to completion……..Squirrel! Now instead of finishing up a current project, I’m all set to try this one! You are a temptress! Thanks for so many good ideas. OK-WHEN are they going to be in stores??? I’ve called and looked online. Nothing. Or do we buy straight from MODA??? Love love ❤️ this idea. As a collector of all those Sweet Shop goidies! I would love a mix that uses layer cakes, charms and Jelly rolls( in some combo). I make minis as well as king quilts! Thanks for making these yummy recipes for us! Very clever – love the idea!!! I love your creativity Carrie! Always great, unique & fun! I can hardly wait to “bake” a layer cake!! I wish I could snap my fingers and get results like that! But truly, an inspired idea. VERY VERY sad and disappointed with Moda fabrics right now! Just completed the quilt “playful” using the Bonnie and Camille line, Vintage Picnic. The quilt turned out beautiful. It is for a very special friend who is getting married on Saturday! Once it was completed, I washed it, like I do all my quilts in cold water and with color catchers and the red bled all over the white! The white is now PINK!!! I have cried buckets. It is soaking in my tub with Oxyclean, but I don’t think I will ever get all the pink out!! SO disappointed in MODA……. Can’t wait to to try something new! Thanks for letting us know that FQS has them now. I can see why you had such fun playing with these! The ‘math nerd’ in me would love to play too! LOL I will have to keep a lookout for these. Can’t wait for thes to hit the LQS. I was lucky enough to be sitting at the same table the Moda rep was taking orders from my LQS and I piped right up about these – can’t wait for them to arrive! Maybe THEN I can whittle down my layer cake pile! Or maybe they’ll be an excuse to buy more! They’re at the Moda booth at Road to CA this weekend! Check them out. I love this idea and love paper piecing. Is there anywhere than I can see pictures of the finished quilts for each recipe? I just watched a tutorial at Missouri Star Quilt company for one of the options and would like to see more. 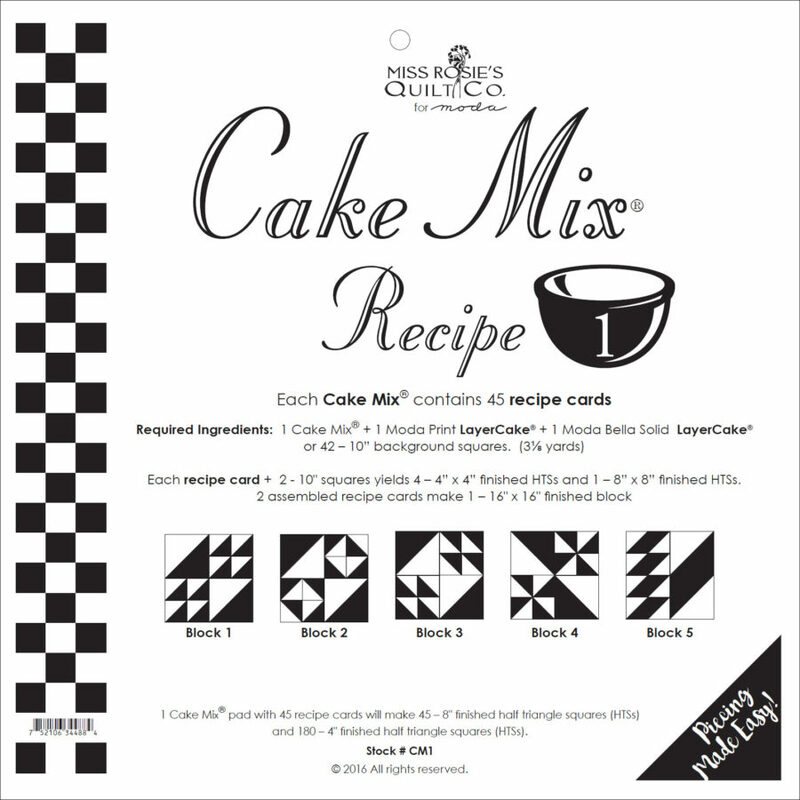 On the Cake Mix page, there is a tutorial video, some general information, and all of the Recipes for the quilts we’ve made using the Cake Mixes. When new quilts are added, that’s where they’ll go.